Gonzaga dismantled another opponent, and this outcome will raise some eyebrows across the college basketball landscape. The Bulldogs roughed up No. 22 SMU 72-56 before a full house of 6,000 Monday at the McCarthey Athletic Center and a national television audience on ESPN2. GU improved to 5-4 against ranked opponents in the McCarthey Athletic Center’s 10-year history. Senior guard Kevin Pangos made five 3-pointers and finished with 17 points. Freshman forward Domantas Sabonis had 13 points and nine rebounds. 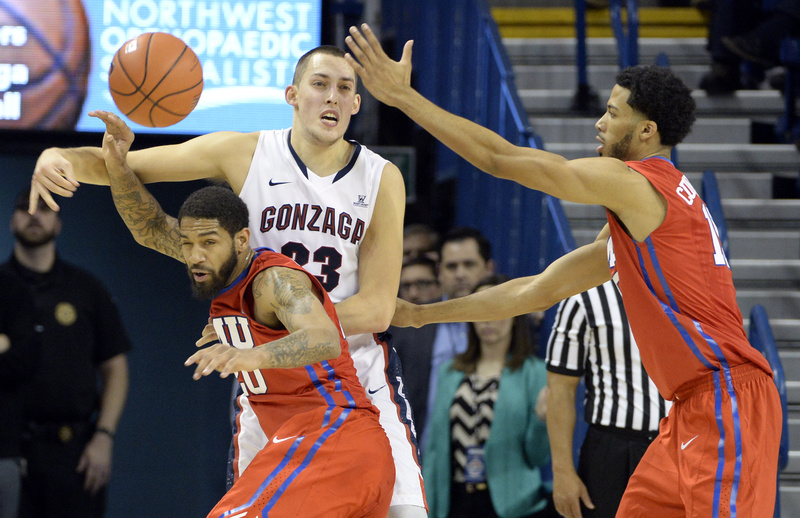 Kyle Wiltjer overcame a slow start to produce 10 points, five rebounds and three assists. Nine different Zags scored at least four points. On this night, GU’s four primary reserves of Sabonis, Angel Nunez, Josh Perkins and Kyle Dranginis all contributed to an impressive victory. Sabonis punctuated the win with a dunk off a no-look feed from Perkins with 1:57 remaining. He was fouled on the play and his free throw gave Gonzaga a 25-point lead, matching its biggest of the night. The Mustangs (1-1) had no answers for the Zags at either end of the court. Gonzaga piled up 20 assists and shot 45 percent from the field. SMU made just 31 percent, 24 in the second half, primarily against the Zags’ matchup zone. Gonzaga won the majority of the 50-50 balls and often converted hustle plays into points. Gary Bell Jr. dove to snag a loose ball and flipped it toward Pangos, who went to the court to collect the ball while being fouled. Dranginis snagged an offensive rebound on a missed free throw and ended up draining a corner 3-pointer in the second half to boost GU’s lead to 56-36. The 13th-ranked Zags, who thumped Sacramento State 104-58 in the season opener, ruled the boards 22-12 in the first half, leading to a seven-point advantage on second-chance points. Gonzaga came out firing from deep – 5 of 16 on 3-pointers in the first half – and retrieving a fair share of its misses. On one sequence, the Zags misfired three times before Pangos connected on a 3. The Zags overcame first-half foul trouble on Przemek Karnowski and Sabonis with a nice contribution from Nunez and Wiltjer’s five points in the closing 4:05. GU, which entertains St. Joseph’s on Wednesday, led by 13 after a Wiltjer tip-in before settling for a 37-27 halftime edge. Gonzaga put it away with a 14-1 run early in the second half. Percentages: FG .311, FT .750. 3-Point Goals: 6-16, .375 (Frazier 2-3, N. Moore 2-5, Martin 1-2, Emelogu 1-5, Cunningham 0-1). Team Rebounds: 4. Blocked Shots: 4 (Moreira 2, B. Moore 2). Turnovers: 13 (B. Moore 3, Frazier 3, N. Moore 3, Moreira, Cunningham, Martin, Brown). Steals: 4 (B. Moore 2, N. Moore, Brown). Technical Fouls: None.